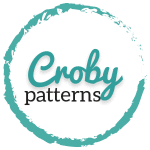 The pattern is written in one size only and will fit up to 6 months old baby. Gauge: 18 sts and 14 rows in hdc measure 4 x 4 inch (10 x 10 cm). * If the number is written in front of the stitch: 2 hdc – work 2 hdc into the same stitch. If the number is written after the stitch: hdc 2 – work hdc into next 2 sts. Chain 28. Start in the 2nd chain form the hook. Row 1: Hdc 27. Ch 1. Turn = 27 sts. Row 2: Hdc2tog. Hdc 23. Hdc2tog. Ch 1. Turn. = 25 sts. Row 3: Hdc3tog. Hdc 19. Hdc3tog. Ch 1. Turn. = 21 sts. Row 4: Hdc3tog. Hdc 15. Hdc3tog. Ch 1. Turn. = 17 sts. Row 5: Hdc2tog. Hdc 13. Hdc2tog. Ch 1. Turn. = 15 sts. Row 6 – 13: Hdc 15. Ch 1. Turn. = 15 sts. Row 14: 2 hdc. Hdc 13. 2 hdc. Ch 1. Turn. = 17 sts. Row 15: 2 hdc. Hdc 15. 2 hdc. Ch 1. Turn. = 19 sts. Row 16: 2 hdc. Hdc 17. 2 hdc. Ch 1. Turn. = 21 sts. Row 17: 2 hdc. Hdc 19. 2 hdc. Ch 1. Turn. = 23 sts. Row 18: Hdc 23. Ch 1. Turn. = 23 sts. Row 19: 2 hdc. Hdc 21. 2 hdc. Ch 1. Turn. = 25 sts. Row 20: Hdc 25. Ch 1. Turn. = 25 sts. Row 21: 2 hdc. Hdc 23. 2 hdc. Ch 1. Turn. = 27 sts. Row 22 – 27: Hdc 27. Ch 1. Turn. = 27 sts. Round 28: Hdc 27. Now continue on the back part of the diaper. Hdc 27. Join the round with ss. = 54 sts. Do not count the chain or ss stitch as a stitch at the beginning/end of round. Round 29 – 32: Ch 1. Repeat (FPhdc into the first one, BPhdc into the second one) 27 times. Ss. Do NOT turn at the end of the round! =54 sts. 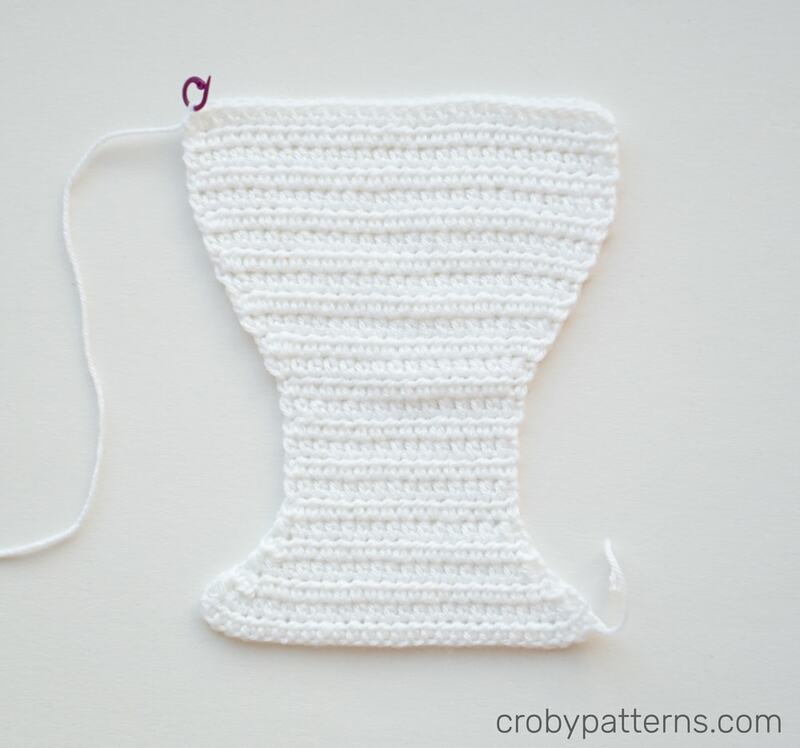 Join yarn on the top of the leg hole (Row 1!) and sc evenly around. Join the round with ss. Fasten off. Take a pompom maker or cut two circles of a cardboard. Cut a small round hole in the middle of each circle. Lay them together and wrap the yarn around it. 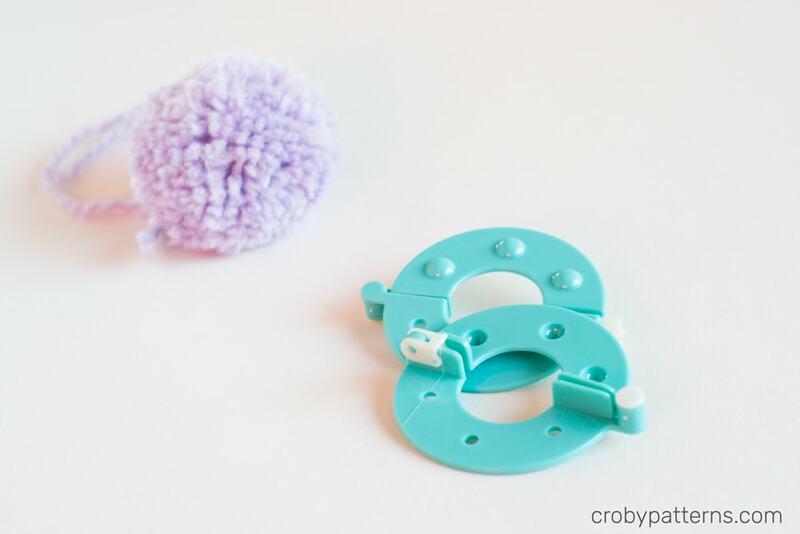 Put the scissors in between the two circles of cardboard or of plastic pompom maker and cut the yarn. Draw a long piece of thread between the two circles. Tie and knot it firmly around the yarn. 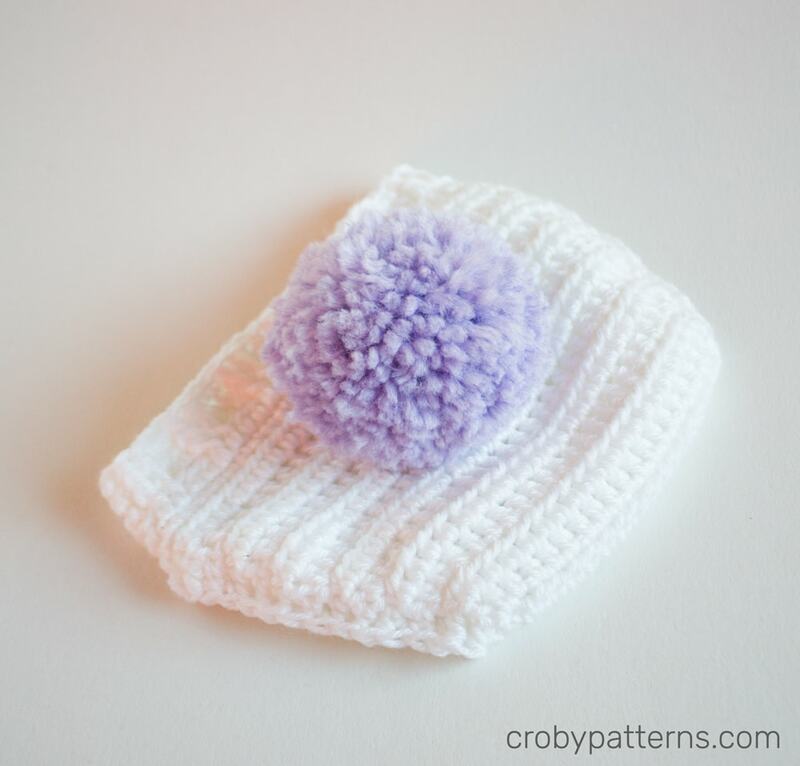 Make a knot and attach the pompom on the back side of the diaper cover. Can you explain row 28? I don’t understand what you mean by “continue on the back part of the diaper”. Do you HDC 27, then join with the front of the diaper, then HDC 27 more? Thanks! I am having the same issue. I don’t understand row 28. Row 27 you are working on the back part of the diaper so if row 28 you are suppose to start on the front, do you cut the yarn after row 27? Directions should be rewritten. I’m so confused. 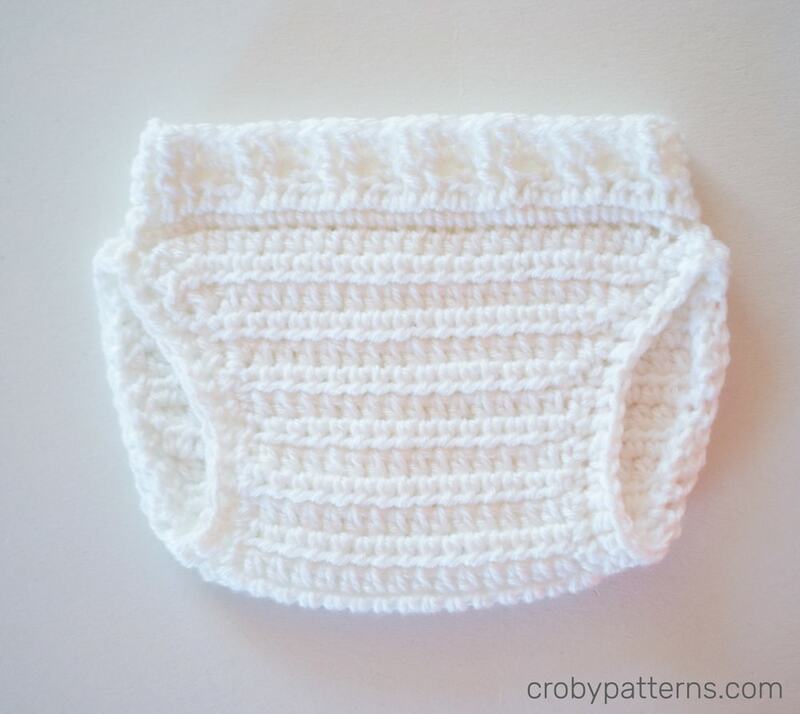 Love your baby bloomer pattern! Made for my great granddaughter. I am still very confused about how to start round 28. The last row (27) is on the back. 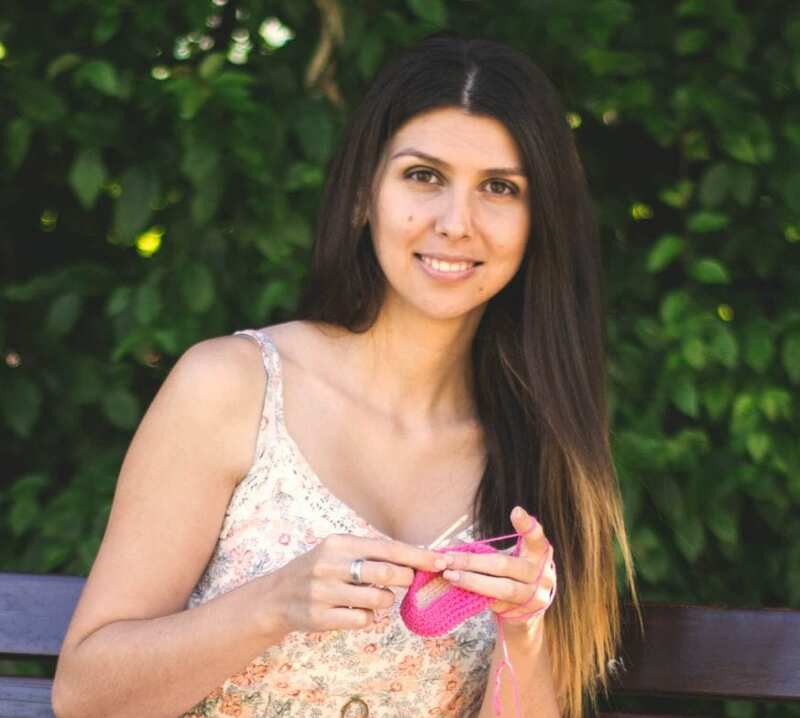 How do I all of a sudden start on the front for round 28 if we don’t cut the yarn and start on the front? The picture isn’t helping me unfortunately. Help please! 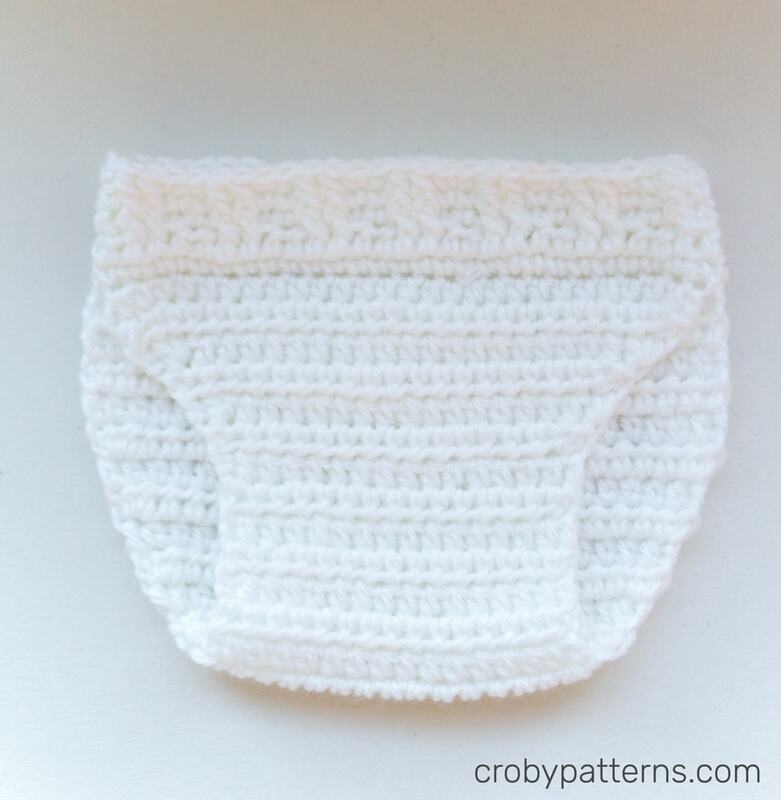 When you finish all 27 sts on the front side of the diaper cover, fold the fabric in half and you will get the front and back side of the diaper cover. When you have that, place the fabric in front of you – back side up. 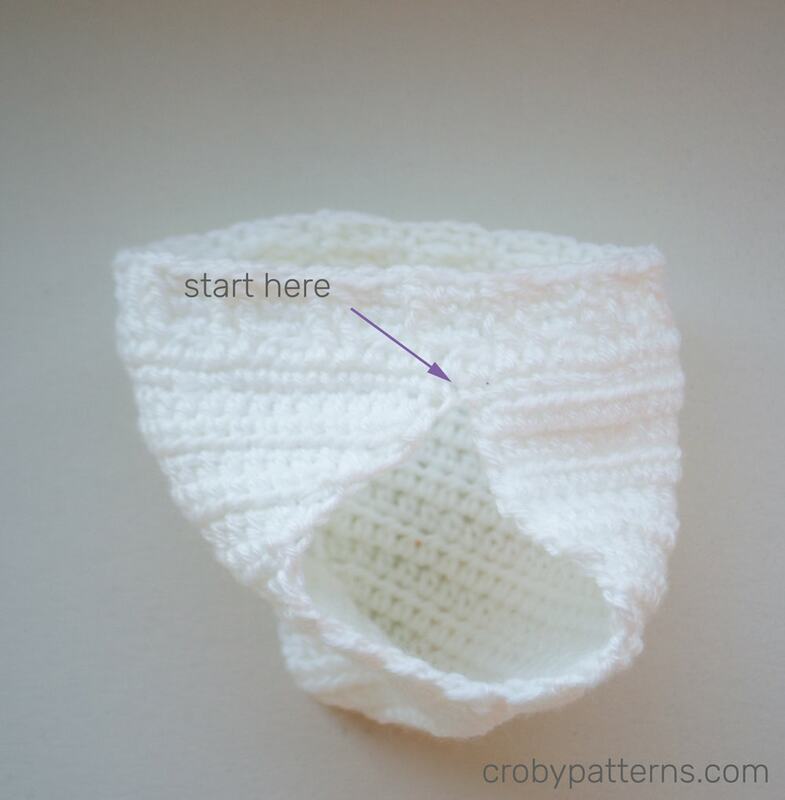 Do not skip or add any stitches, and continue crocheting on the back side. When you complete all 27 sts on the back join the round with a ss made into the very first st of this round on the front side of the diaper cover. With completing this round, you join the front and back side of the diaper cover together.